Knockoffs, fakes, and faux; purses, watches, now processors. It’s hard to believe but that’s what’s happened. Thanks to the guys at HardOCP for this find. No one is saying that NewEgg did this intentionally but it seems their supplier downplayed the counterfeit aspect by stating the processors were “demo units”. No one bought that, and in fact all the arrows pointed to counterfeit. 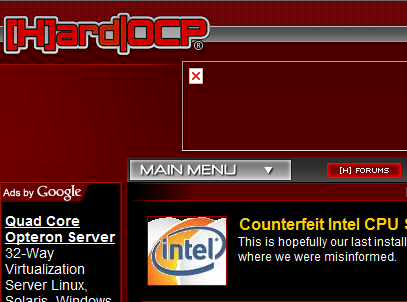 Here is further information from some unsuspecting recipients at the Overclockers Forums. I hate to think that this is going to be a regular occurrence. It would be impossible for the average user to police, as most have no idea of what’s in their system. It stands to reason that it was “overclockers” that caught this scam. Overclockers are the ones interested in every aspect of the processor they receive. I just hope this doesn’t become a necessary part of receiving computer hardware shipments. You can follow the whole chain of events here. I’m calling my local supplier right now, I wonder how they overclock! 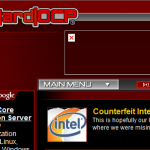 The Pit Blog demo units, hardocp, intel processors, overclockers forums, purses. permalink. They originated in the back room of some rip off artist.